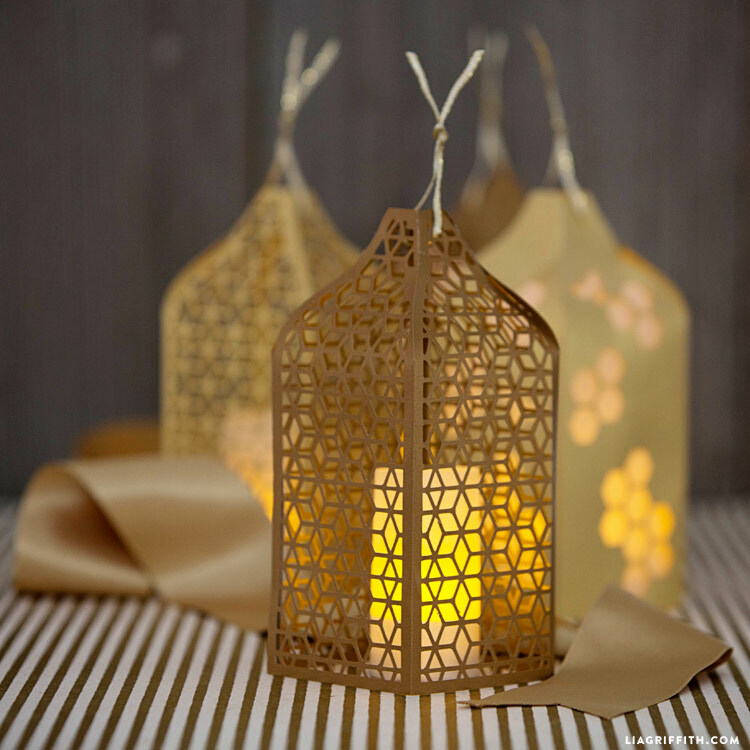 Paper lanterns are a really easy way to create a beautiful decor accent. You can style them on your mantel or end tables, and paper lanterns in general are particularly popular for wedding decor. 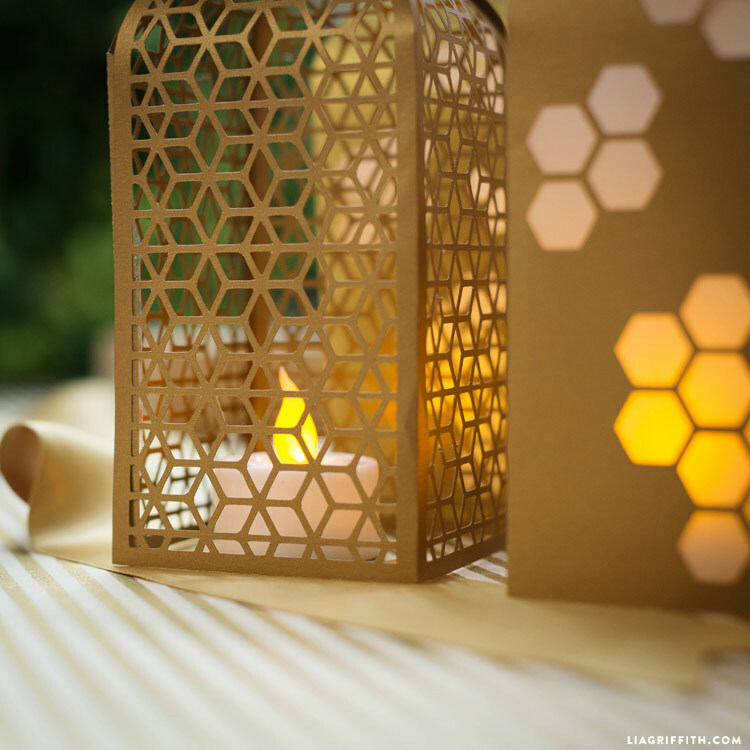 Our paper honeycomb lanterns in gold are gorgeous for fall centerpieces and displays. They also happen to match our Honey Bee Wedding Set if you want to incorporate these into your DIY wedding! There are two designs for the honeycomb lanterns – a cage design and one with comb clusters and honey bee illustrations. Download the SVG file if you are using a cutting machine, or choose the PDF version if you are cutting by hand. We used two shades of metallic text weight paper with our Cricut (links in Shop this Project), but if you are printing the PDF you can simply use regular copy paper. Once you cut out the designs, fold them along the edges and use double sided tape or a glue dot roller to adhere the tab. 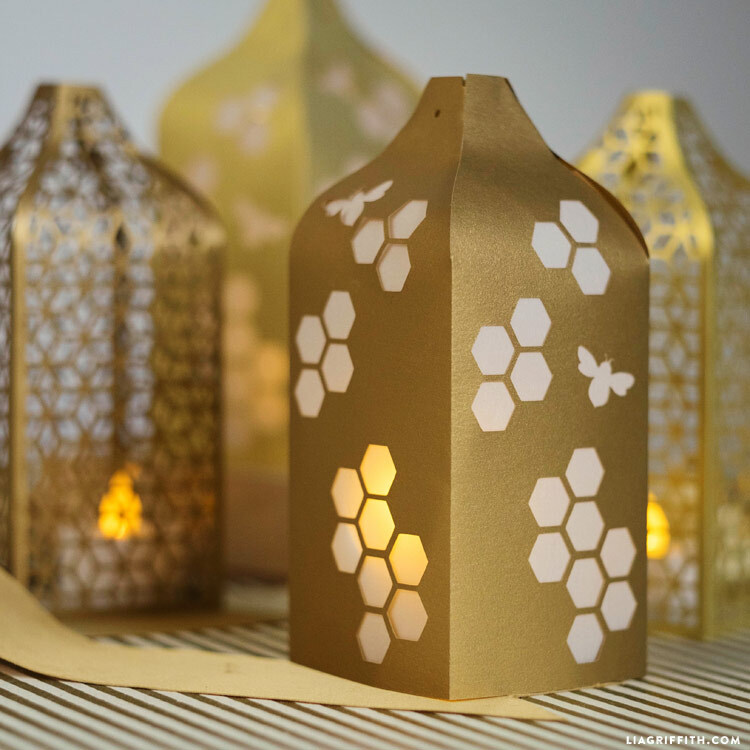 We also added little bits of gold ribbon to the top of our honeycomb lanterns as a finishing touch. Pop LED tea lights into the lanterns and voila! We loved the look of the cage honeycomb lantern, but we did not want to be distracted by the plastic light, so we wrapped a square of metallic vellum around the candle. 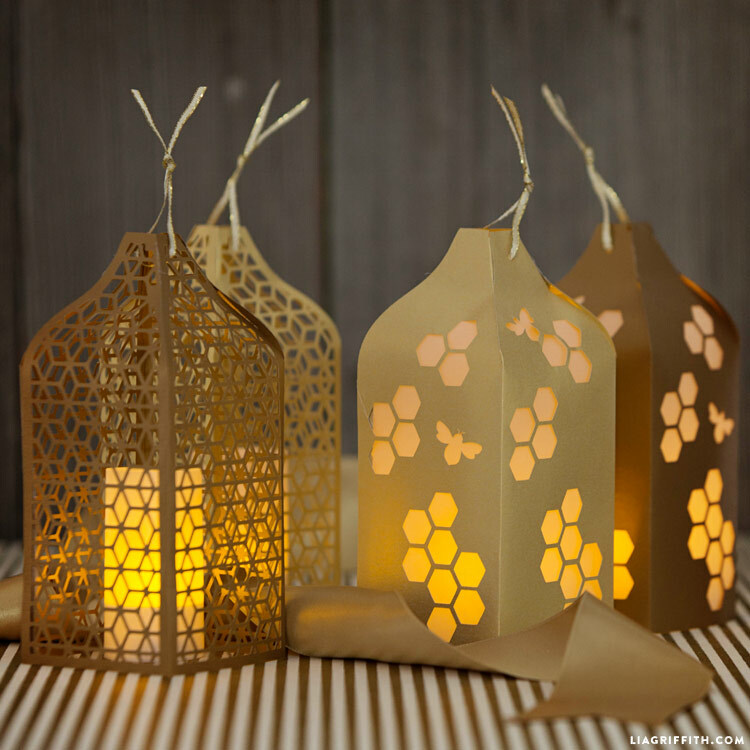 You can also add some vellum to the inside of honeycomb lanterns to reflect the light. We love how they turned out. These lanterns look great on their own, but you can also hang them or string them into a garland. Use the SVG version to cut the lanterns in different colors for any season or occasion. It’s up to you how you want to style them! Has anyone tried this with the Silhouette to see if it is compatible? Please let me know! Love the designs. They are cutting out great, but I am having a problem fitting the top part together. Should I score the little tabs at the top. Appreciate your suggestions on getting the top to fit together properly as shown in the photos. Hi Janet! Sure, scoring the tab up top will probably help. Score and fold them first, then assemble the bottom part of the lantern, and then finish with the top tabs. I think that there may be a corruption in in this file. All of the other files i’ve been working with from your site recently have been working well but this one does not produce anything meaningful on the Cricut. Could you send a photo/screenshot of what you’re seeing to hello@liagriffith.com? We tested this SVG file and didn’t have any trouble. Hi! I love this lantern…. thank you. When I upload the svg into design space, there are two pages to cut. I can see that the first page has the honeycomb sides. What is the second page. Thanks for your help! Hi! When you upload the file, there should be 5 layers. 1 is our copyright information, which you can hide or delete. 2 layers are score marks, and 2 layers are the different honeycomb designs. The second page is probably popping up if you didn’t attach your score lines to your design. Love your designs! Just wondering why the score marks aren’t an intrinsic part of the cut file? It would seem like it would just save us a step. Am I missing something? Thanks to you and your team for all your hard work!! How do I open an SVG file from a zip? Do I need my machine on? And will it go to my I pad? On a Mac, you just double-click the zip file and it will open a folder where the SVG file. You have to upload it to Design Space from a computer first before using your iPad to cut. Hi Lia! Love the lantern design. I’ve always been obsessed with all things hexagon. I’ve been trying to get the svg file to cut in the cricut design space however it keeps telling me “Remove exclusive content” and will not allow me to cut. Help please! I’m so glad to hear it 🙂 That happens once in awhile with our content, it’s a bug that can usually be fixed just by quitting and restarting your web browser, and/or re-launching Design Space. How i open this in cricut design? I love Bees however I’m deathly allergic to them – Awesome pattern!! I prefer bees in prints and on cute patterns like this 😉 So glad you like it! What problem are you having? I checked the files and everything looks fine on my end. I love bees and any thing to do with bees! These are fab!